You stand a chance of forgetting where you are. Forgetting while public speaking is an enormous fear. When you can speak from note cards or from a visual aid, such as a powerpoint presentation, you then have the ability to look back at your notes or the screen to help you get back on track should you forget where you are. With memorization, you have nothing to draw upon aside from your memory. That is a frightening thought! Public speaking is the art of communicating with an audience. Memorization does not allow for the process of communicating because when you deliver a memorized script, you are merely spitting out a pile of words in a particular order. Part of the beauty of public speaking is recognizing how your words are affecting your audience. If your delivery is rote, then you have no sense of what your listeners are hearing. I worked with a man who was in the business of giving 90-minute presentations. That is an incredibly long time to speak – especially from memory – but when he delivered just 5 minutes of his material, the class sat with eyes glazed over. And that was after only 5 minutes! What was fascinating is that during his spiel, he forgot a word. At that point, he looked up to the ceiling, searching in his mind for the word he wanted to use; and, in those few moments, he looked and sounded natural. It was the only time that he actually talked to us and not at us. People go out of their way to hear public speakers. If they were interested in listening to a memorized performance, they would go to the theater. Public speaking is not acting. And, acting is not public speaking. 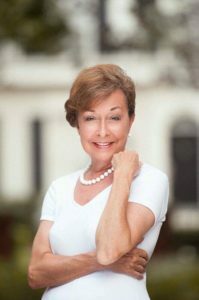 Your job, as the speaker, is to talk to your audience, not spit out a pile of words at them. 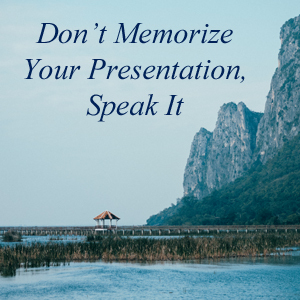 Memorizing a speech or a presentation takes a lot of work and a lot of energy. Why not spend that energy on knowing your material so that you can talk to your audience just as if you were having a conversation in your living room? Your listeners will gain so much more from your words if it comes from your heart and not from a memorized script.